Nokia Lumia 730 Dual Sim carries the official tagline – ‘Made for Selfies’ and through this they have run a massive campaign to set a world record for the world’s largest selfie, taken by a mid-range Windows phone. Taking selfies has become so pervasive that it has almost managed to erase the concept of taking a picture through a rear camera. 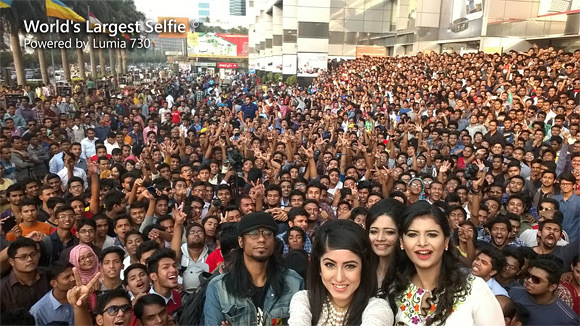 The result of this massive campaign is a shot of at least 1,151 people taken in Dhaka city in Bashundhara City Shopping mall. In order to keep track of the numbers, participants were required to sign in their names. Although the record hasn’t been confirmed yet by Guiness so till now it still didn’t get into the books of being the largest selfie.